ГЕОНТ - представительство американо-канадского туроператора GEONT TOURS в России. С 1993 года ГЕОНТ предлагает услуги Российским компаниям и частным лицам в США и Канаде. ГЕОНТ предлагает Hornblower Cruises в США. 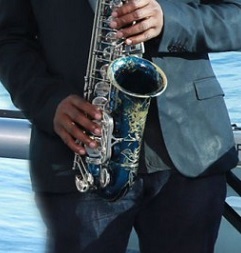 Hornblower Cruises & Events NY, the largest dining, sightseeing and charter yacht company in the US. Enjoy a decadent three-course dinner and after-dinner dancing, as well as sights of the Statue of Liberty, Ellis Island, the Brooklyn Bridge and New York’s iconic Manhattan skyline. If you are looking for the perfect relaxing lunch in NYC, Hornblower’s Lady Liberty Lunch Cruise is for you. Step aboard Hornblower’s luxury yacht and lunch in style as you cruise by New York’s iconic landmarks including, of course, the Statue of Liberty, Ellis Island, Governors Island, the Brooklyn Bridge and amazing views of the Manhattan skyline. All of this while enjoying an exquisite lunch buffet, dessert station and on board DJ. Coffee, tea and a cash bar is also available. Spend a long lunch with good friends, celebrate a special occasion in style, or get your local church or community group together for something different. 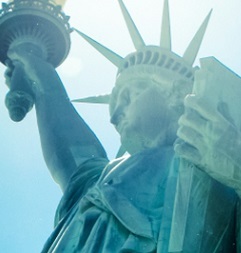 Hornblower’s Lady Liberty Lunch Cruise, has all the hallmarks of our dinner cruise, including the first-class service. May – October: Thursdays and Fridays. Enjoy our bountiful brunch buffet of classic breakfast favorites as well as chef-selected specialties, accompanied by free-flowing mimosas. Combined with our live world-class jazz band and award-winning onboard DJ, you’ll never look back at the traditional land-locked NYC brunch spots again. 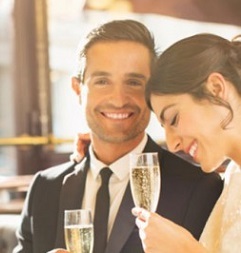 Leave land behind and celebrate your next birthday, private engagement party, bridal or baby shower overlooking the city skyline and iconic NYC landmarks. May – October: Saturday and Sunday. Rock the yacht with our endless array of savory bar snacks and artisan cocktails; hit the dance floor to smash-hits and classic throwbacks from our live, onboard DJ; get selfie-ready with classic backdrops of Lady Liberty, Freedom Tower, Brooklyn Bridge & more! San Francisco is one of the most beautiful cities in the world—and you can see its legendary landmarks from the comfort of a luxury yacht. Start with a delicious four-course dinner made onboard, seasonal ingredients. 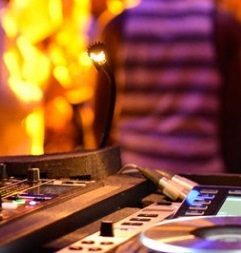 Then head out to the middle of the deck for a spin on the dance floor. As the sun sets and the city lights come up, you’ll get a breathtaking view of the Golden Gate Bridge, Coit Tower, and the TransAmerica pyramid, among many other sights. 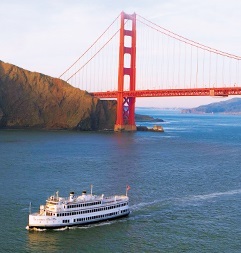 Dinner Cruise: set against twinkling city and legendary vistas, the experience includes an elegant four-course dinner, live music and dancing around the San Francisco Bay. 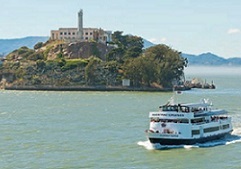 Champagne Brunch Cruise: live music and scenic views of the San Francisco Bay make the Champagne Brunch Cruise popular with locals and visitors. With a lavish buffet and free-flowing champagne. It is a perfect compliment to the weekend. Alcatraz is best known as one of the world'slegendary prisons, once home to some of America's most notorious criminals from 1934 to 1963. Tours include a 45 minute award-winning audio tour.